What better way for Cynopsis to celebrate our 20th Anniversary than by honoring the best of the best in the industry we’re so proud to cover? 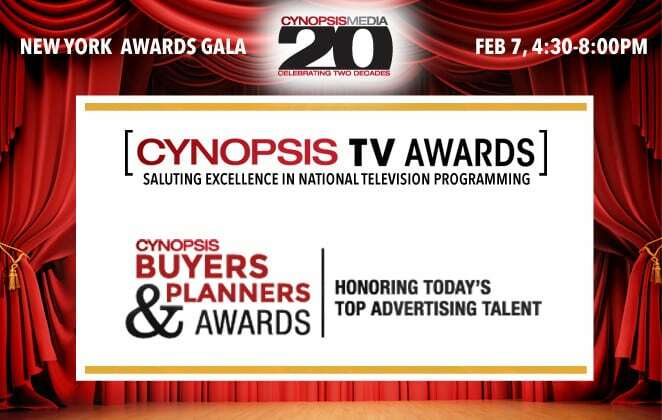 A reception to celebrate our two decades will take place February 7 at the Edison Ballroom in New York City, followed by a dinner highlighted by the presentation of the very first Cynopsis TV Awards, saluting excellence in national television programming. Also, two special awards will be presented to honorees Linda Boff, CMO for GE and Bill Koenigsberg, President, CEO & Founder for Horizon Media, for their extraordinary contributions to the industry. The industry’s top advertising talent will be celebrated at the inaugural Cynopsis Buyers & Planners Awards. Strategists, communicators and executors of campaigns will be recognized for their incredible contributions across broadcast, cable and digital platforms. Register your company’s table for this unforgettable evening! Interested in sponsoring the event or placing a congratulatory ad? Contact Cynopsis’ VP of Sales/Marketing Mike Farina, 203.218.6480.